Pack a pair of walking shoes in your luggage. Hikes in the Netherlands lead you to the country's famous sights: the North Sea, Van Goghs, and windmills. Stroll any street in the Netherlands and you'll quickly learn: bicycles rule the streets. But if you'd rather stay on two feet than two wheels, the same flat terrain that makes the country great for biking makes it ideal for walking, too. 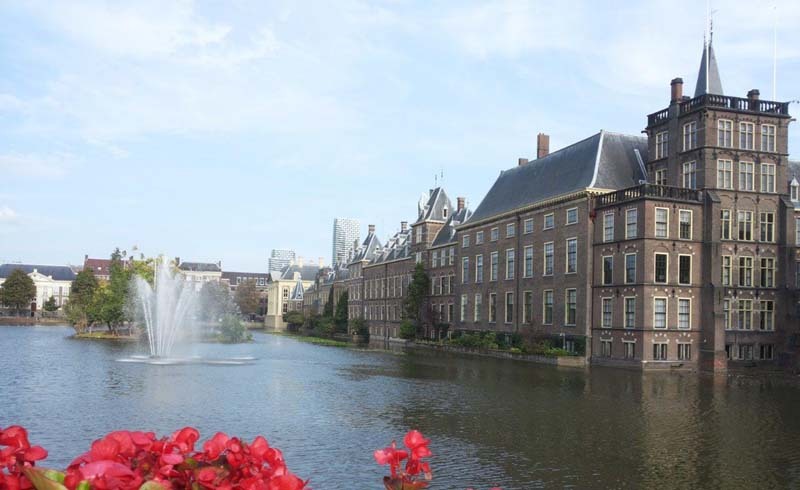 Walking in the Netherlands will take you to many of the country's best sights. You can wander along miles of canals in Amsterdam, with charming gabled houses everywhere you look, or head out into the countryside to explore diverse terrain that includes forests, sand dunes, and shoreline. You won't need heavy-duty hiking boots, but pack a pair of walking shoes in your suitcase and head out to explore these great sites. Roam through a forest on foot, then wander through a gallery filled with Impressionist treasures and a sculpture garden filled with modern masters. A day in De Hoge Veluwe National Park delights your eyes with natural and man-made beauty. Pick up a trail map at the park entrance or visitor's center. There are trail options as short as 3.5 kilometers (2.2 miles) and as long as 20 kilometers (12.4 miles) to match your fitness level and time constraints. You'll walk through forest and grassland, so keep your eyes peeled for big creatures like deer and boar and smaller creatures like the toads, frogs, and newts you can spot around the bogs. If you want to bike like the Dutch without braving the two-wheeled traffic in the streets of Amsterdam, this is your opportunity. The park is famous for its white bicycles, free to borrow and pedal to the sights. Whether you get around the park's natural scenery on foot or on bike, save enough energy to explore the Kruller-Muller Museum afterwards. The museum is home to one of the world's largest Van Gogh collections, and its outdoor sculpture garden has close to 200 works by artists like Auguste Rodin and Henry Moore. Pack a light daypack filled with the essentials for a day of adventure when you set off on this walk. Hiking in Kennemerduinen National Park is one of the most varied walks in the Netherlands—or anywhere else, for that matter. Trails take you through woodlands and berry-bearing shrubs like the buckthorn plant and then to sand dunes that offer lovely, soft footing before you reach the ocean. Bird Lake is filled with cormorants and swans. You'll also see Scottish Highland cattle, looking huggable with their long shaggy hair that hides their eyes, along with Wisent bison from certain vantage points. Though cattle are not typically park dwellers, both species were introduced to the park to graze, minimize grass, and let the dunes shift and reshape naturally. Finally, after about five kilometers (3.1 miles), you reach the beach, on the North Sea coast of Holland. Enjoy lunch in the restaurant there and search along the shoreline for seashells including razor clams. Expect to dump a lot of sand out of your walking shoes at the end of the day! If you've packed a nicer change of clothes in your luggage, head back to the park for dinner. The Michelin-starred Restaurant De Vrienden van Jacob restaurant is located in a different section of the park and you can splurge on an inspired meal as you gaze out at a lake. Think of the Netherlands and you think of cheese, wooden shoes, and windmills. You can't miss seeing a windmill in the Netherlands—both traditional squat ones with broad sail arms and modern white, tall, and slender ones are everywhere. 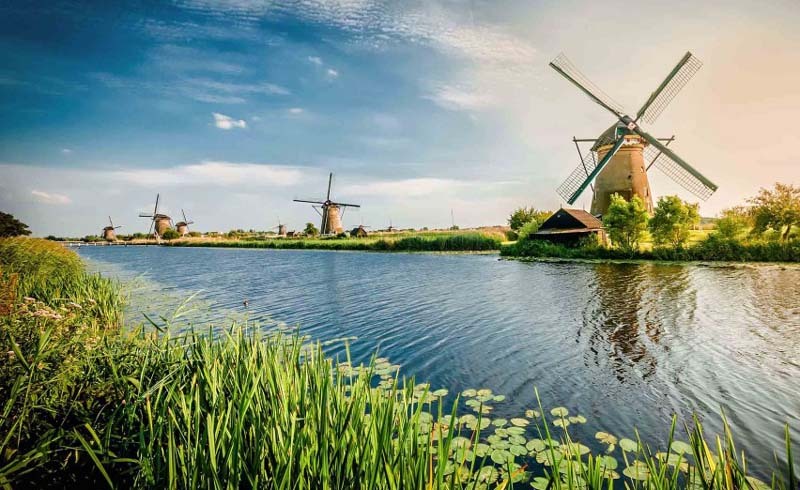 Head to Kinderdijk to walk near 19 traditional windmills, built to pump water and prevent flooding. You can enter the windmill museums or roam over polders—the land between the dikes—crossing small bridges over canals and passing through quaint villages bordering sheep pastures. You may spot herons in the water and harriers in the skies above. A walk here can be as long or short as you choose to make it.